The last time we were in Puerto Rico during the holidays was when little one was 6 months old. I took him to Puerto Rico to meet la familia and it was during the month of December. This past Christmas, hubby, little man and I all went to Puerto Rico! This was a holiday vacation that had been a year in the making. 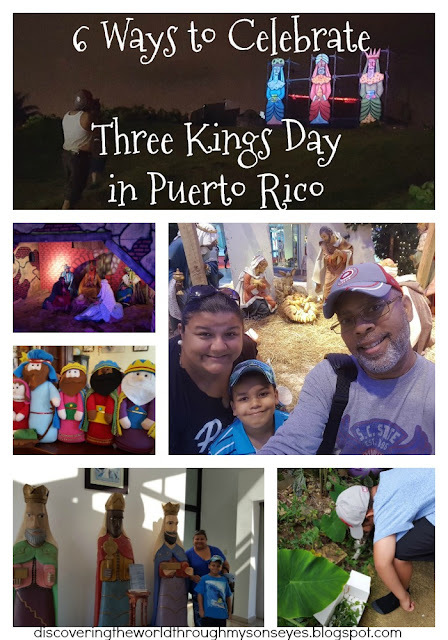 I planned every single detail of this trip, and the one celebration that I really looked forward to was Three Kings Day! I wanted my son to experience celebrating Día de Reyes in Puerto Rico. 2) Visit La Lomita de los Vientos La Lomita is actually a hill right across the Capitol building overlooking the ocean. It has been set-up as a replica of Bethlehem, where you will see a live re-creation that leads up to the night Jesus was born, and the visit of the Magi. Our son received a traditional box to use for the camel’s grass, and a booklet of Puerto Rican Christmas carols. 3) Visit La Casa Museo de Reyes in Juana Diaz. 4) Santa pictures? Forget that! Have pictures taken with Los Reyes. We found them at Plaza Las Americas (a mall). 5) Visit La Fortaleza where the governor and his family will have a traditional Fiesta de Reyes. It’s an all-day event with a tour around el Palacio Santa Catalina, a Christmas concert, and toys are handed out to the children. 6) Participate in a Día de Reyes festival and parade. The one is Juana Diaz is actually the most popular one with a caravan that drives past various towns, and cities. Most importantly, enjoy this day with family and loved and always remember the true spirit of Christmas.